Why are some corn rows left behind? They catch your eye as you drive across South Dakota during the fall and winter months. Long stretches of corn stalks, two to four rows wide, instigating curious thoughts in the minds of travelers who wonder why? Did the farmer miss or forget them? In agriculture, more often than not, there’s a method to the madness. One reason for the remaining rows could be a snow break. The standing stalks will create a natural snow fence preventing excess snow from piling up on rural roads or highways. Famers use the roads as much as anybody and it’s a nice gesture to neighbors. Some farmers use the rows as a tool for moisture control. The snow collected can give the soil an extra boost of moisture in areas that are normally drier than others. Or the rows may prevent excess snow from accumulating on spots that can be too wet during spring planting. Another reason would be a feed source for wildlife. 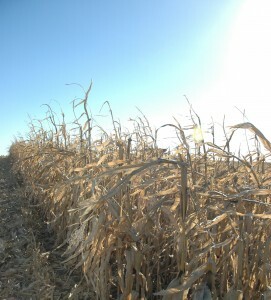 Pheasants and deer thrive off of eating field corn, especially when the snow starts to accumulate and temperatures drop. Farmers enjoy having wildlife around their farm and do their part by contributing their corn as a feed source. So the next time you see some standing corn rows on your drive let your passengers know that while it may seem crazy not to harvest the standing crop, farmers are leaving those bushels behind for good reasons. After all, South Dakota farmers are the True Environmentalists. This entry was posted in Education and tagged corn, snow, South Dakota, True Environmentalist, Wildlife.